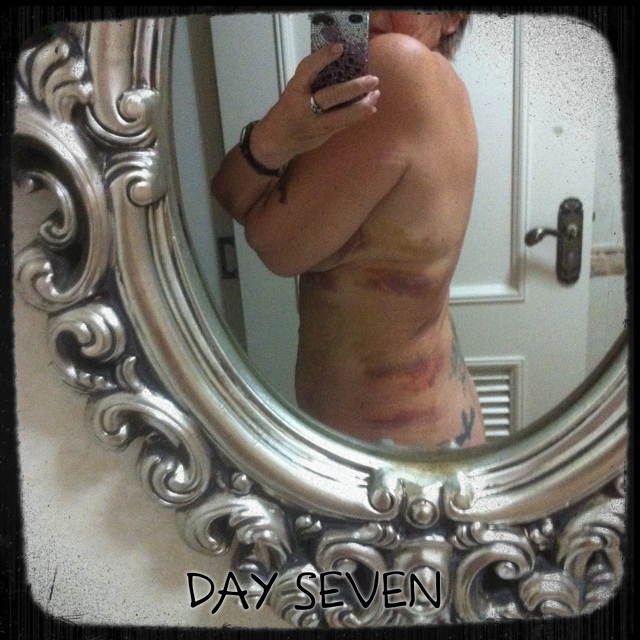 I’m one week out from my liposuction and I still feel pretty beat up. I am still pretty bruised up. I’m taking Tylenol twice a day and Traumeel by mouth three times a day. I’m also putting the arnica cream on in the morning after my shower. I had my 11 sutures removed this morning by a doctor wearing a skirt that was very short! She’s cute as a button, I’ll have to try to get a pic of her. She can’t be more than 23! 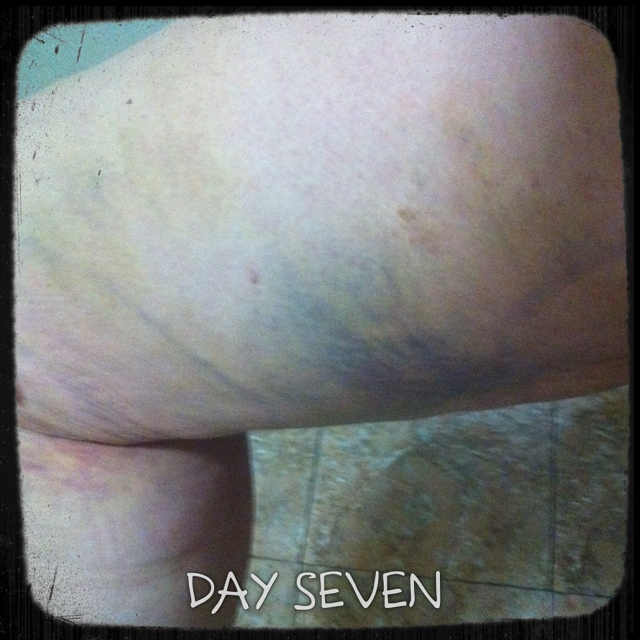 I’m going to share bruising pictures today. I could find very little info about this and I think people should be prepared. 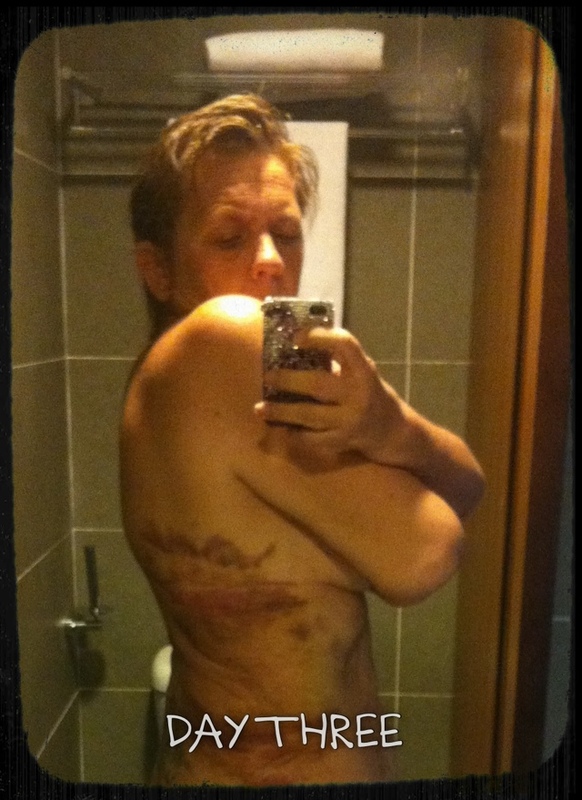 I had NO idea how much pain and how much bruising I would have. Also, I have a lot of numbness everywhere that was liposuctioned and the skin/muscle whatever feels very tight and sensitive over the flank area on my back. I also have the sensation that something is poking me in that area, even when nothing is touching it and that is the area that I have the most pain in when lying down. My thighs are still pretty tender and swollen… See, Momma, I haven’t withered away to nothing… Still got some meat on my bones 😀 my thigh looks huge in this picture, lol and no, I’m not suffering body dysmorphic issues. I’m very pleased thus far with the results. I keep getting new bruises in different places. I have one right between my breasts and one that developed the last couple days on my left breast… Odd, but I’m presuming normal. 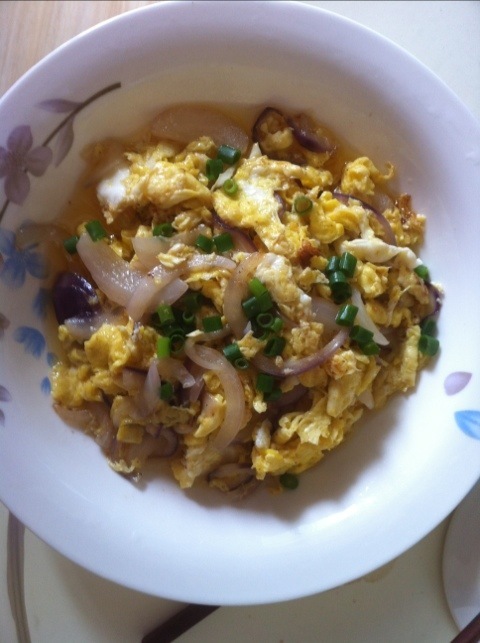 Scrambled eggs with onion and Edam cheese and chives. Scrambled in a tsp of coconut oil. 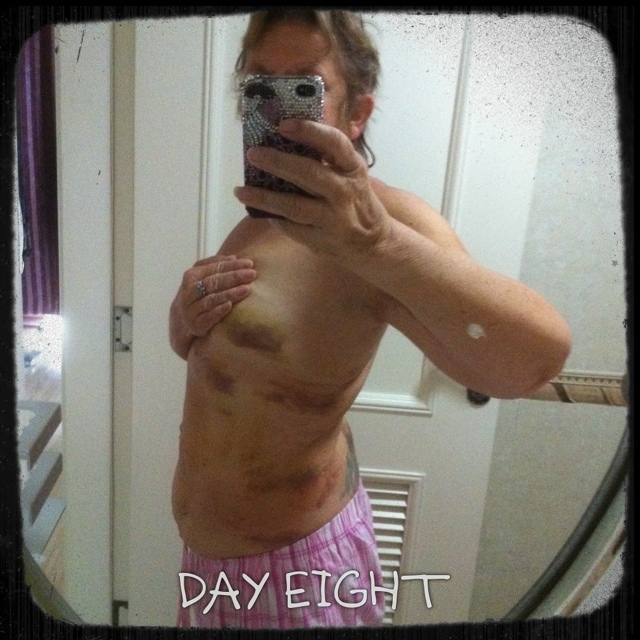 This entry was posted in China, Dukan Diet, Weight Loss and tagged how will I feel after liposuction, how will I look after liposuction, liposuction, pain by flamidwyfe. Bookmark the permalink. I feel for you. 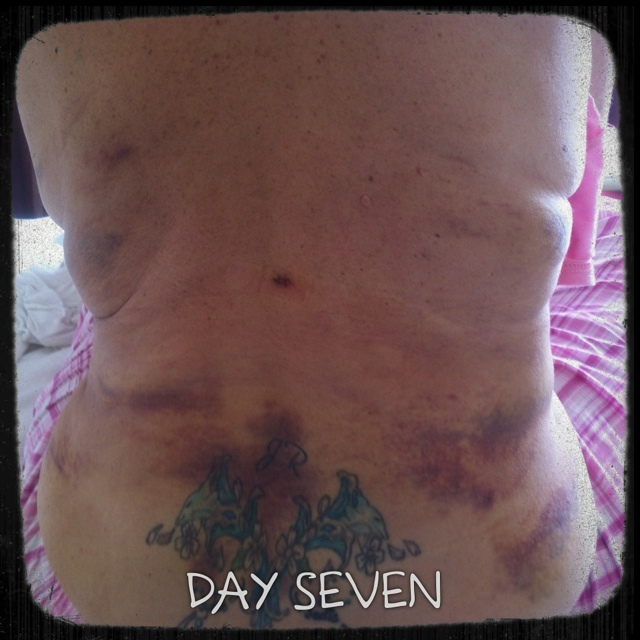 You look great, btw, underneath all that bruising! And can’t wait for the big news! OMG! So bruises aside, LOOK HOW SKINNY YOU LOOK!!! Thanks, Charlotte! It’s the yoga and running… I knew it was working… Lol, it was just hiding under that thermal layer they sucked out of me 😀 So glad you are back… Missed you! I can’t tell if the bruising has reduced or not, you are just a purple mess! I hope it is causing you less pain! Let’s hope the knees look fantastic right? Pleased as bees about the knees? Now your a poet. LOL . Beyond the bruising You look runway ready. Watching and waiting for the good news. You are one brave woman…not sure I could do that. Ouch!! But you look fantastic!! Thanks, Meg… The yoga and running have really shaped my body… I’m missing both! Can’t wait til next week when I can go back to both. FA-BU~~ holey smokes you look good in purple 🙂 that running is doing good things to your bod and the bruises will pass, they already look better. The thigh thing is an issue w/ single body part I think. I did photos a while back and I really dig my ample and well muscled calves but when I had the hubs take a pic of just one….it looked utterly freaky. Smooch-U-Face Sandi you just are SO going for it ALL….love that. Thanks, my friend 🙂 Purple is my favorite color, may as well wear it ON my body, hehe. Missing the exercise, but got a good 1.5 mile walk home from Arabic dinner tonight… Yummy, yummy food!